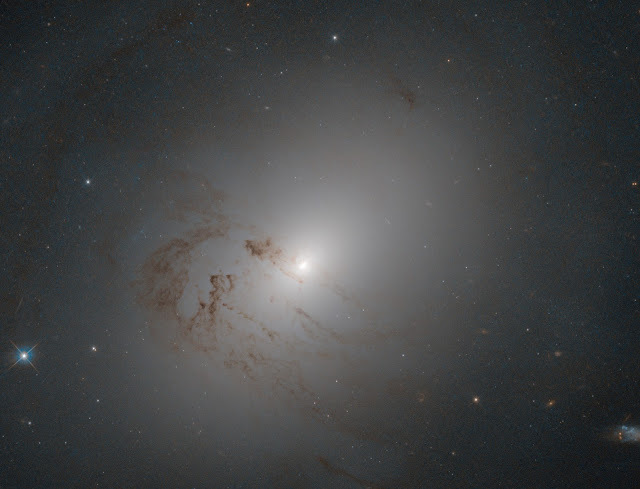 This pretty, cloud-like object may not look much like a galaxy—it lacks the well-defined arms of a spiral galaxy, or the reddish bulge of an elliptical—but it is in fact something known as a lenticular galaxy. Lenticular galaxies sit somewhere between the spiral and elliptical types; they are disc-shaped, like spirals, but they no longer form large numbers of new stars and thus contain only ageing populations of stars, like ellipticals. NGC 2655’s core is extremely luminous, resulting in its additional classification as a Seyfert galaxy: a type of active galaxy with strong and characteristic emission lines. This luminosity is thought to be produced as matter is dragged onto the accretion disc of a supermassive black hole sitting at the center of NGC 2655. The structure of NGC 2655’s outer disc, on the other hand, appears calmer, but it is oddly-shaped. The complex dynamics of the gas in the galaxy suggest that it may have had a turbulent past, including mergers and interactions with other galaxies.